Sharing the fun and creativity in my world and encouraging the same in yours. Why I Love Gardening and Fresh Produce. Growing up, we always had a vegetable garden. In fact, my father at age 80, still plants one every year although on a smaller scale. When he started, we had an average family-sized garden. Then, when I was 10 years old, we moved to a house with two acres of land and the use of an adjacent barn and many more acres to garden…errr, farm. To give you an idea of the size, I remember planting 350 tomato plants one year. In fact, we ended up using one huge tract of land with two smaller tracts and we had enough produce to have a roadside vegetable stand every summer with plenty leftover for canning and freezing. The money we earned from the stand helped pay for family vacations (camping with our pop-up trailer). We had four apple trees in our front yard: one Rome, two Red Delicious and my favorite, a Winesap tree. There really is nothing like a Winesap/Red Delicious apple pie! We also had a huge Golden Delicious apple tree in the back that looked like a giant snowball when in bloom! We had a raspberry patch, a small rhubarb patch, a pear tree, and a plum tree on our property. We tried planting new cherry trees but the birds always ate the darn things before we could pick them. In fact, someone once told us that’s how you tell they’re ripe – when the birds eat them! 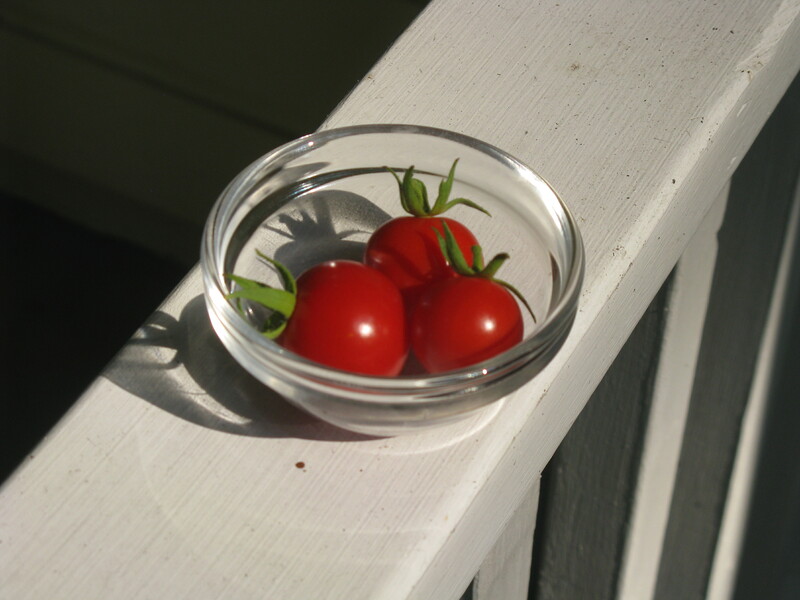 These beautiful red Cherry Tomatoes came from a truly scrawny plant. Over the years, we planted rows upon rows of corn (Silver Queen was a favorite), tomatoes (red, yellow, cherry, and big ol’ juicy Jersey tomatoes) as well as green beans, green peppers, yellow banana peppers, onions, radishes, carrots, lettuce, asparagus (not too much success with these), strawberries, celery (rabbits loved the young growth, so I don’t think we ever got a chance to grow those fully), cucumbers, pumpkins, zucchini, squash…and more! We hoed, planted, watered, weeded, and harvested the produce. My mother froze and mostly canned the food, making our own ketchup, chili sauce, raspberry jam, pickles, and such to have during the off-season. There really is nothing better than homemade, seedless raspberry jam but I have to tell you, it is time-consuming to make. It has always been a dream of mine to have a vegetable garden, not necessarily the size from my childhood but enough to provide for my family and maybe some friends and/or neighbors. I have come to the conclusion that, with Florida’s sandy soil and our root-filled yard, it will have to be a raised vegetable garden. I’d also love a herb and flower garden. I’ve planned it for a while now and as soon as we can afford everything we need (squirrel and cat-proofing included), it will be a welcome and fruitful project! So far, I have had to satisfy my gardening urges with experimenting with flowers in various locations in our yard and in window boxes, transplanting established shrubs, flowers around the yard, and taking down a lot of trees to make room for some sun. Little by little, I’m learning what works best in this soil, climate, and yard…and what doesn’t. Have you had any success with raised beds? I’d love to hear about them! Copyright 2012, 2013 – All rights reserved. Feel free to browse the Categories here for fun and creative inspiration, however, I am no longer taking typing, proofreading, editing, writing work. I'm pursuing a different path. If interested, click on my Twitter profile to learn more. Thanks for visiting! My son and I have put his nature photographs (and some of mine) on notecards, postcards, and calendars. You can buy them here. Please know all of the photographs on my site are copyrighted - and are not to be reproduced in any way, shape or form: all rights are reserved. Thank you. https://lisascreativespace.wordpress.com Copyright 2011 - 2015. All rights reserved.